The intent and purpose of the Local Lodge 1725 Legislative Committee is to actively be involved in the process of political education. This is done in a nonpartisan way, to ensure that the interests of our members, the working class of our country, are being best served by our elected officials on Local, State, and Federal levels. Several areas are involved. Goals range as simple as a left turn arrow at the intersection of West Blvd and Billy Graham Parkway, to interviewing candidates running for office, to reviewing bills from the House and Senate. Issues addressed stay within the agenda of items affecting health & safety, human rights, issues affecting jobs, etc. The committee remains clear of personal issues, as well as issues that really have no bearing on members of our Local as a whole. I want to thank this membership for sending me as a delegate to the NC State AFL-CIO Legislative Conference in Raleigh on February 12th. We spent the beginning of the day discussing topics as well as the process of lobbying the General Assembly. Next it was on to lobbying. One of the most important tasks we can do as Labor advocates is to lobby our elected officials. It is a necessary function for us to reach out and explain our issues, our agenda and to teach them the needs of labor and unions. The CLC is looking forward to big things this year and we can’t wait to share them with you! Saturday Nov. 3, we will talk to union members around the area to get out the vote for the mid-term election and our endorsed candidates! Local candidates will join us in the morning to discuss their races. Please see the document below. 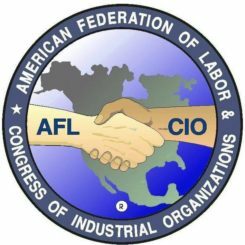 This is the 2018 Election Slate of all candidates in North Carolina officially endorsed by the NC AFL-CIO. These candidates have been fully vetted for their stances on labor issues. Feel free to print this guide for reference! *Click on image for full-size document! 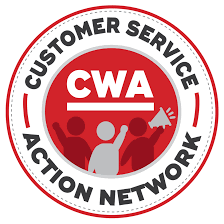 Our mission is to build an independent political power for working people by driving a pro-worker legislative agenda, electing pro-worker candidates including our own members to office, holding elected officials accountable, and winning policies on all levels to help working people. To achieve our goal the “we” must be all of us. If all of us work together, we can build a movement that is constantly growing and full inclusive. The North Carolina AFL-CIO in conjunction with the Southern Piedmont Central Labor Council and Victory Lodge 1725 will be conducting a series of phone banking efforts to help get out the vote. Please take this opportunity to make a difference by helping to support labor/union friendly candidates in the upcoming November election. You can volunteer at either one of the locations and times listed below. 1900 Cross Beam Dr. 5108 Monroe Rd # B. Do you live in the Triad area? Interested in hearing what your local candidates have to say about labor issues that directly affect you as a union member? 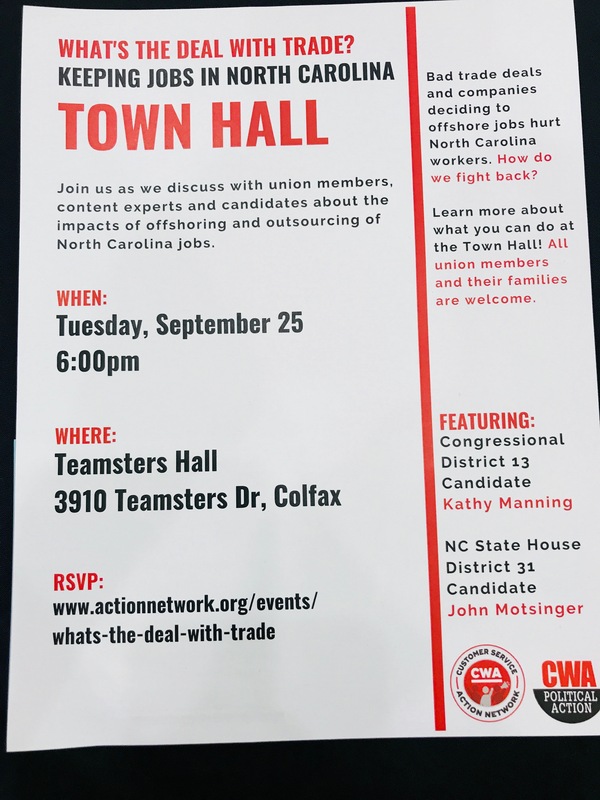 Join us in Colfax, NC on Tuesday, September 25th at 6:00pm for a Town Hall with Congressional District 13 Candidate Kathy Manning and NC State House District 31 Candidate John Motsinger. 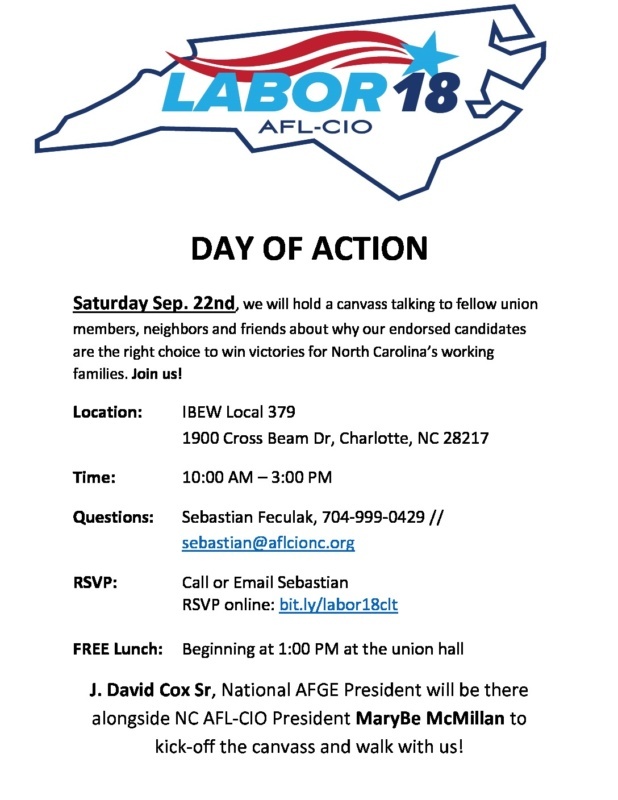 Saturday Sep. 22nd, there will be a canvass talking to fellow union members, neighbors and friends about why our endorsed candidates are the right choice to win victories for North Carolina’s working families. Join us! Please see the flyer below (click on the thumbnail for the full size flyer) and print or download. Feel free to post on your union bulletin boards as well. 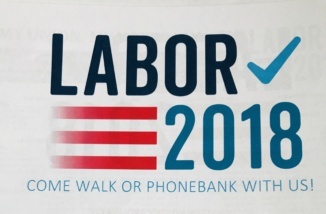 Starting last Saturday, June 23rd the national AFL-CIO kicked off Labor 2018 Programs all across the country with Labor Walks, Phone Banks, Worksite Leafleting Programs, and more. 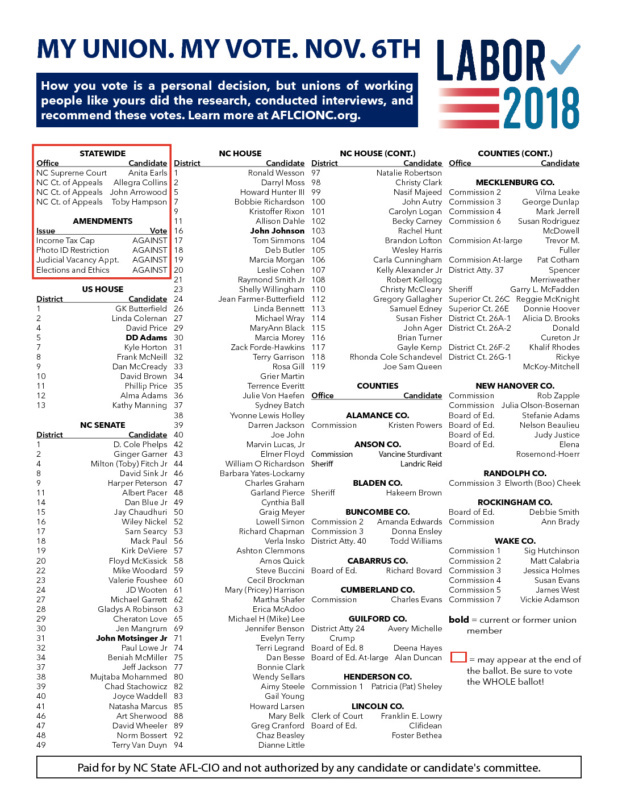 Here in NC with your help, we are participating by kicking off a Week of Concerted Activity, distributing the attached Issue Surveys to members and collecting their information as they pledge to be volunteers and an active part of Labor 2018. 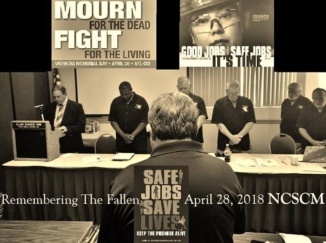 The NC State Council of Machinists gathered at Pine Knolls, Atlantic Beach, NC on 26 April for its convention. We had a two day session of business with speakers from the IAM, AFL-CIO as well as a candidate for office.